Dr. Joseph Rowey Partner at Vision Associates/ Optometrist A co- founder of Vision Associates and former president of the RI Optometric Association, Dr. Rowey graduated from Providence College while obtaining his doctorate from the New England College of Optometry. Dr. Rowey specializes in contact lenses. Maximizing his experience with very little finances while studying at college in Boston is a time Dr. Rowey will never forget. Married 41 years and counting, Dr. Rowey enjoys time with his wife and 2 daughters. Playing tennis, attending country music concerts and watching sports are a few of the hobbies Dr. Rowey enjoys during his free time. Dr. Dena Hall Partner at Vision Associates/ Optometrist Dr. Dena is a graduate of the University of Rhode Island and obtained her doctorate from the New England College of Optometry. Dr. Dena specializes in dry eye/lid disease, contact lenses, diabetic care and macular degeneration care. During her studies in college, Dr. Dena recalls her residency at the Omni Atlanta as a memorable time that she appreciated. Dr. Dena serves as an active member on the Board of Optometry in RI. Aside from that, Dr. Dena loves spending time with her husband and 2 kids. Jazz, ballet, skiing and horseback riding are hobbies Dr. Dena loves to take part in as well. Dr. Eric J. 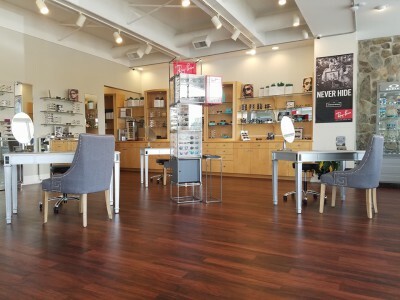 Hall has been an optometrist with Vision Associates since 1999. Dr. Hall practices all aspects of primary eye care and his license includes treatment and management of ocular disease including Glaucoma. His scope of practice includes treatment and management of ocular disease, emergency care- including foreign body removal, pre and post operative care of surgical procedure, including cataract and refractive surgery. He has special interest in contact lenses and dry eye disease. 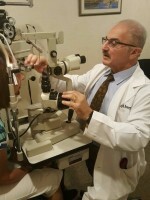 He completed his externship with the Newport Naval Base in Rhode Island, Providence Veterans Hospital, Brockton Veterans Hospital, and the South Boston Community Health Center, then graduated from the New England College of Optometry in Boston, MA. Dr. Eric is married with two children and enjoys coaching his sons hockey team and daughters softball team. Dr. Ronald Hall Partner at Vision Associates/ Optometrist A co-founder of Vision Associate and former president of the RI Optometric Association, Dr. Hall is a graduate of the University of Rhode Island while obtaining his doctorate at the New England College of Optometry. Dr. Hall specializes in neurological optometry as well as contact lenses. Caring for under privileged children and adults at a clinic on Beacon street in Boston Ma was a memorable time for Dr. Hall during his time in college. 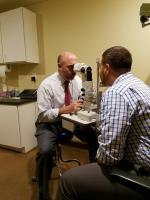 Dr. Hall is the father of fellow partners and optometrists Dr. Dena Hall and Dr. Eric Hall. During his free time, Dr. Hall spends his time sailing, golfing and skiing with his family and friends, especially his wife and grandchildren. 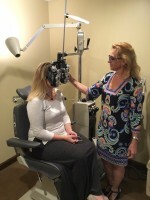 Dr. Holly Dwan Optometrist Dr Dwan has been with Vision Associates since 2006. She is a graduate of Assumption College and obtained her doctorate from the New England College of Optometry. Dr. Dwan specializes in pediatric optometry as well as contact lenses. While in school, Dr. Dwan recalls her 4th year residency at the VA in Boston as a time during her studies that she will never forget. In her free time, Dr. Dwan enjoys spending time with her 2 boys and husband while also taking up hobbies such as rowing, kayaking and tennis.